Many people turn to pastel, that lovely rich, direct medium, after experiencing the horrors of watercolour, which seems to have a mind of its own, and sometimes it seems, a vindictive one. Pastellist Jenny Keal has just brought out a new book Painting With Pastels, a superb guide for both beginners and the more experienced artists. It is mainly concerned with landscapes, although she has included a number of flower paintings as well. 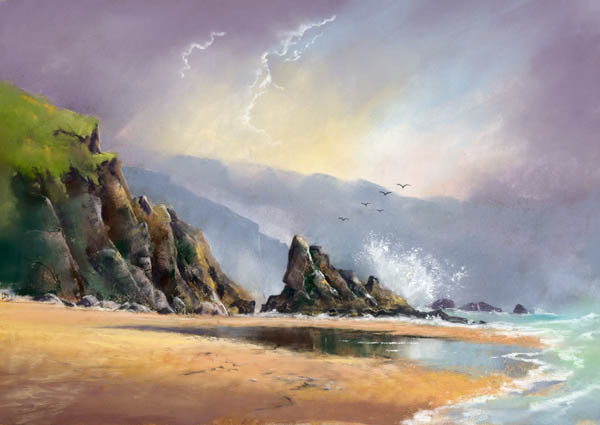 Barafundle Bay in Pembrokeshire has a gem of a beach and in this painting Jenny has done it proud. She turns a good subject into an outstanding composition with a number of devices. Firstly, the long background cliff-top can intrude, but see how she has softened it off in places, introducing mist here and there with a judicious smudge. She has not been tempted by the cold, featureless sky, but has warmed it up to echo the foreground sand colour. All the background has been achieved in tones of grey, but she emphasises the power and solidity of the rocks with bold, determined strokes of a dark pastel that bring them closer to the viewer and thus creating a marvellous sense of space and distance. Pastel is a lovely medium for suggesting reflections in wet surfaces, and Jenny’s rendering here has a mouth-watering quality, with lovely soft edges all round. One of her outstanding techniques with pastels is that of flaking – scraping the pastel stick and letting the droppings fall onto a selected area on the painting, then pressed in with a painting knife. Here you see the method used on the white splash, which truly brings the painting to life!